Vaikunta Ekadasi festival is observed at Tirupati Balaji Temple during the Shukla Paksha Ekadasi in Dhanurmasa – the eleventh day during the waxing phase of moon in December – January. In 2020, Vaikunta Ekadasi at Tirupati Balaji Temple is on January 6. Vaikunta Dwaram opening time is 4:30 AM on January 6, 2020. The most important ritual on the day is the witnessing of the opening of the door in the sanctum sanctorum of the temple also known as ‘Vaikunta Dwaram’ or ‘Swargada Bagilu’ (the gate to the heaven). Devotees can pass through this door only on the Vaikunta Ekadasi day. Vaikunta Dwaram as the name indicates is the door to Vaikunta – abode of Srihari Vishnu. The door is opened only on this day. The utsava murti of Balaji is taken around the Mada Street on Vahanas on this day along with Sridevi and Bhudevi. The main ritual on this day is the passing through the Vaikunta Dwaram. Apart from this devotees observe fast on the entire Ekadasi day. Devotees consider it highly meritorious to have darshan of Venkateswara on the day. Vaikunta Ekadasi is said to be highly significant among all the Ekadasis as Amrita or Ambrosia appeared on that day. The spiritual significance of this day consists in the known tendency of humans to aspire for immortality or Amritatwa in a world governed by mortality or Mritatwa. When the Gods and Demons, the Suras and Asuras churning the mighty ocean (samudra manthan) for Amrita, the latter was born after great effort. The day in which Amrita appeared is celebrated as Vaikunta Ekadasi. Vaikunta Ekadasi or Mukkoti Ekadasi as it is called is observed with fast, prayer, chants and meditation, Japa and Dhyana. The austerities in connection with Vaikunta Ekadasi start with Dasami. Its strict observance is marked by ‘Ekabhuktam’ or taking food only once on Dashami followed on Vaikunta Ekadasi by a rigorous fast or at least a partial fast for those who cannot observe a complete fast for various reasons. It is followed by breaking of the fast on Dwadasi or the twelfth day of the waxing or bright fortnight. Consuming water and milk is allowed during a rigorous fast or taking fruits along with these during a partial fast. Observing a fast is supposed to control senses and purify the body. The mind in a body thus restrained, it is felt, will become pure. A purified body and mind help one to attain proximity with the divine or the Paramatman. How is Vaikunta Ekadasi Observed in Tirupati Balaji Temple? In Tirumala, Vaikunta Ekadasi and the next day, known as Vaikunta Dwadasi are both celebrated with great fervour and gaiety. The golden thresholds are shut on the night of Dashami, a day before Vaikunta Ekadasi after Ekanta Seva of Lord Venkateshwara. The next morning, that is on Ekadasi, the Mukkoti pradakshanamarg, or doorway, will be kept open till the ekanta seva of the Lord on Dwadasi. This doorway is adjacent to the sanctum sanctorum of the Lord and is situated to the North and hence it is described as the 'Uttaradwar'. It is also known as 'Vaikunta Dwara'. 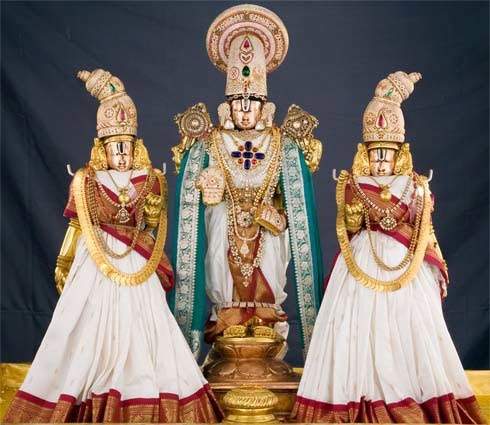 In Tirumala, in the morning of Vaikunta Ekadasi, the Lord parades through the mada streets of Tirumala, accompanied by both His Consorts Sridevi and Bhudevi. It is a magnificent sight indeed! The next day, i.e. on Dwadasi, a utsavam called Swami Pushkarini theertha Mukkoti utsava is celebrated. It is believed that three crore sacred rivers go to have a dip in Swami Pushkarini of Tirumala. The sanctity of this event is described in the Venkatachala Mahatmyam of Skandapurana. Sudarsana, the devotee and weapon of the Lord, goes to Swami Pushkarini to have a dip. This is called 'Chakrasnanam'. It is said that three things, namely, a holy dip in Swami Pushkarini, salutations to the feet of a sadguru and the observance of Ekadasi Vrata are deemed to be three holy deeds that can bestow material as well as spiritual benefits on the devotees. Source - some notes and reference taken from Sapthagiri Magazine published by Tirupati Balaji Temple.